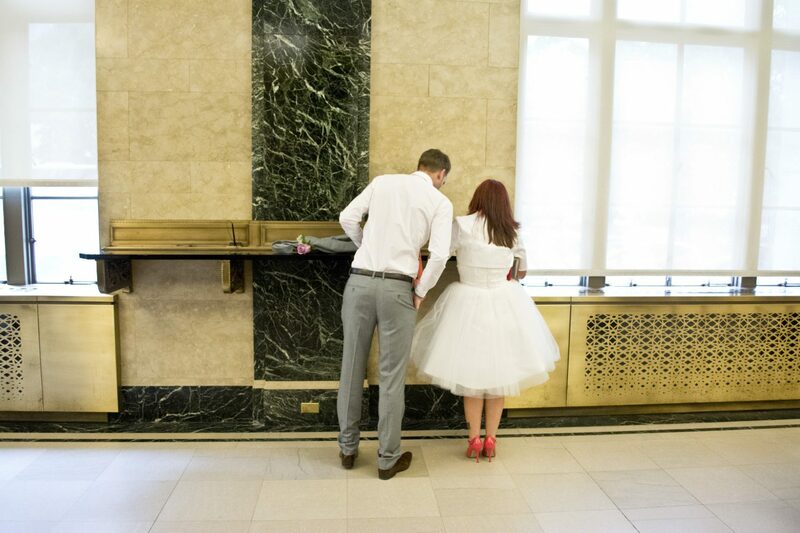 City Hall Wedding Cheat Sheet NYC by Photographer Angela Cappetta. I’ve been shooting at City Hall NYC for decades. I absolutely love it. The people watching alone is worth the trip. Nowhere else in the world will you see a Vera Wang gown walking out of the same chapel as an African kente cloth wedding dress. A Hugo Boss tux five feet away from an off duty mailman tying the knot on his lunch break. In like fashion, I have compiled the three top questions I get. And these answers are based solely on my own personal experience. How long is a city hall wedding ceremony? A City Hall wedding ceremony is in and out boom. The nuptials themselves take about ten minutes. However, the check in process is where the time is spent. For example, some days you have to clear security and wait on an intake line, like in an airport. Then there are days where you have to wait for your number to be called, like in an old fashioned deli. There are also the days where you get your number, the family is late, and you have to get another number. The amount of time you wait is roughly based on weather or now your party is organized. Being there on time and arriving together can save you about a half an hour. But if you don’t care, then sit back and people watch. They’ll get there when they get there. What is so special about city hall weddings? Ah, where to start. Its never the same day twice at City Hall. I’ve shot loads of couples eloping from other countries simply because they love the idea. It is easy to romanticize. Whisking away and eloping. Furthermore, eloping under everyone’s nose. There’s something timeless about it. How do you make a city hall wedding reservation? In short, you can’t. But if you see my notes above about waiting time, you’ll get a good idea of how you should prepare. You do need a witness, but if you hire me, I’m happy to sign your witness papers. Check out the Marriage Bureau website for more info.